And on and on it goes. Pareidolia never sleeps. 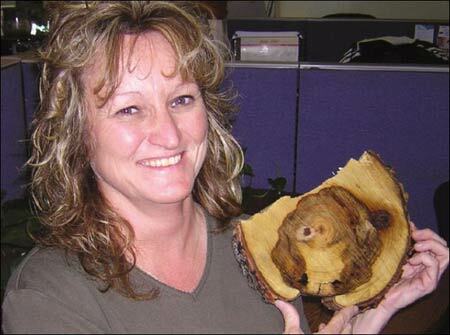 â€œThe more I look at it, the more I think itâ€™s an angel,â€ Sherri said. Like most people, the Conklins have had some rough moments in their lives. But things have been better lately, and Sherri expects them to improve even more. â€œI feel like I have a guardian angel now,â€ she said. John Hott, site superintendent at Kickapoo State Park, said different natural factors could create such a design or image. "It could be sap seeping into the pattern of the growth ring, or it could be environmental factors," he said. ... though it's not really a skeptical comment; it didn't say anything about people seeing random patterns and interpreting them according to their culture. Still, it's better than the usual "neighbor says it looks like an angel too" type of thing. So, as usual, post your best guesses in the comments. I do not see an angel at all. Honestly! At least the bird at the state fair looked like an angel. Can anyone see an angel here? I see a mutated cyclops koala. Maybe the branch was from a eucalyptus tree. Tip o' the halo to Fark (as usual, NSFW stuff there).